Samford University’s Ida Moffett School of Nursing has received more than $2.3 million to help make graduate nursing education more affordable for currently practicing or teaching nurses committed to careers in nursing education. Samford’s $2,347,221 Nurse Faculty Loan Program (NFLP) grant from the U.S. Department of Health and Human Services, Health Resources and Services Administration is the second largest in the country and one of only four nationally that exceeds $1 million. This is Samford’s 15th year to receive funding for the program. NFLP grants are designed to help ease a national shortage of nursing educators, according to Jane Martin, nursing school senior associate dean and project director of the grant. Students who receive loans for master's or doctoral degree programs can have up to 85 percent of the loan forgiven in exchange for service as full-time nursing faculty members at an accredited school of nursing. According to a report by the American Association of Colleges of Nursing, in 2016, U.S. nursing schools turned away 64,067 qualified applicants. Nearly two-thirds of the nursing schools responding to the survey pointed to a shortage of faculty and/or clinical preceptors as a reason for not accepting all qualified applicants into their programs. More than 92 percent of faculty vacancies were positions requiring or preferring a doctoral degree. “Since 2008, the NFLP has provided grants to eligible students in Samford’s post-master’s Doctor of Nursing practice options. These graduates have helped fill faculty vacancies in a variety of academic settings throughout the nation,” said Gretchen McDaniel, associate dean for graduate nursing programs. “As our graduate program transitions to the [Bachelor of Science in Nursing] to D.N.P., students in the new Health Systems and Administration concentrations, including Informatics and Transformation of Care, will have the opportunity to receive NFLP funding,” she added. The NFLP was approved by Congress in 2002, and Samford was one of the first 55 nursing schools from across the U.S. to receive funds. Samford’s NFLP grants now total more than $11.4 million, and 585 students have benefited from NFLP awards at Samford and are serving as nurse educators across the country. The 2017–18 grant is expected to help more than 150 students from 15 states in Samford’s doctoral nursing education program. Samford received the largest of five grants in the state of Alabama. The University of Alabama at Birmingham ($726,580), the University of Alabama ($690,596), the University of South Alabama ($423,035) and the University of Alabama in Huntsville ($146,790) also received grants. 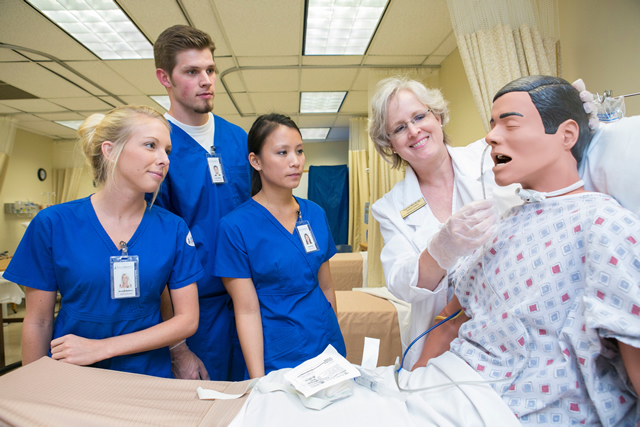 To apply for admission to Samford graduate programs in nursing, go to samford.edu/nursing/graduate-nursing.